Found on: The Marianas Swiftlet can’t be found anywhere else in the world, but here in the CNMI’s islands of Saipan and Aguiguan. They live only in limestone caves. They build their nests along the walls of the caves. The Swiftlet are sensitive to any disturbances, whether it is visits from cavers or tourists, or even other animals like rats or cocroaches. Any disturbance can break up their flock and may leave them stranded. 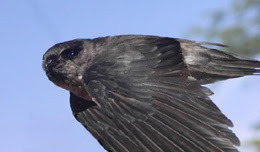 Facts: Swiftlets are small black to dark grey birds, with a slightly lighter colored chest area. They have long, narrow wings to help them fly quickly. They have a dark line through their eye, and a square shaped tail. Swiftlets use a special technique that helps them find their way out of limestone caves in the dark, which is where they nest. They make a very fast clicking sound that bounces off the walls in the caves which helps them maneuver around. This technique is called “echolocation”.